Following on from Blair's defeat over the 90 day nonsense there's a brilliant piece in The Guardian that pulls apart The Sun's pro-Tony stance by talking to the person whose photograph from the 7th of July was placed under their headline 'Tell Tony He's Right'. Not only was bomb victim John Tulloch against yesterday's proposal he's also anti Blair and outlines very eloquently exactly why. "This is using my image to push through draconian and utterly unnecessary terrorism legislation. Its incredibly ironic that the Sun's rhetoric is as the voice of the people yet they don't actually ask the people involved, the victims, what they think. 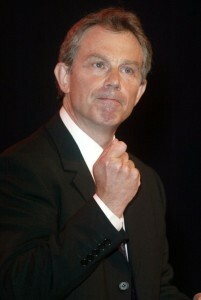 If you want to use my image, the words coming out of my mouth would be, 'Not in my name, Tony'. I haven't read anything or seen anything in the past few months to convince me these laws are necessary." "The floor was all buckled, there was a crater and someone was in it. I didn't want to look and I couldn't see properly, fortunately. I looked back across the carriage. There were bodies and beyond I could see the other train [which had stopped alongside as a result of the blast]. It was surreal." Two photographs, he says, struck him particularly forcefully: "One of the suicide bombers, Germaine [Lindsay], with his wife and babies. Here was this loving woman with her children, their faces pixillated out to protect them. It brought tears to my eyes. I just felt sad for her and what's going to happen to her." The second image, however, made him furious. "I saw those photos of Blair at Gleneagles. I saw his performative act, the way he put his head down and held his hands. Of course he was ready for it. Of course he had his performance all ready for it. I was very angry about that."